With a blend of classic elegance and modern sophistication, the renowned Omni William Penn Hotel has served as Pittsburgh’s premier hotel since 1916. This historic hotel features 597 beautifully appointed guestrooms including 38 suites, 52,000 square feet of flexible meeting space, and five dining options. The hotel boasts two self-contained conference centers, gift shop, and a jewelry store. The hotel was designed by renowned Architects Benno Janssen, and Franklin Abbott. It was the last building venture of Henry Clay Frick, one of Pittsburgh’s wealthiest industrialists, and completed at a cost of six million dollars. Frick envisioned the William Penn as Pittsburgh’s showplace, designed to rival the great hotels of Europe in Old World style, and with the sophisticated technology offered by the twentieth century. The initial phase of the hotel included 1,000 guestrooms, and an elegant two-tier Grand Ballroom located on the 17th floor. In 1928, construction of the Grant Street Annex addition commenced. Completed in 1929 it added an additional 600 guestrooms as well as the crowning jewel, the Urban Room, designed by Joseph Urban. With this addition, the William Penn became the largest hotel between Pittsburgh and Chicago, and a major convention facility for Pittsburgh. From the early days to present time, the Omni William Penn Hotel continues to hold the stature of Pittsburgh’s “Grande Dame”, and the hotel’s roots in the city remain well grounded. The hotel continues to be a favorite among Pittsburgh’s social scene, and remains a favorite of many dignitaries, movie stars, and important leaders in business and government. 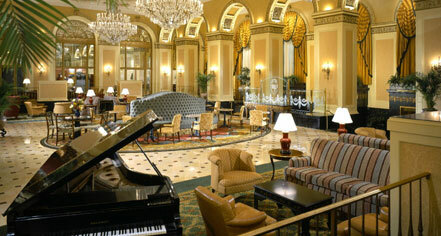 Omni William Penn Hotel, Pittsburgh, a member of Historic Hotels of America since 2010, dates back to 1916. As of 2016, every seated president since Theodore Roosevelt had visited the hotel, including President Barack Obama. Cancellation Policy: Cancellations must be before noon prior to the day of arrival. Cancellations made within this time frame will be charged the room cost for one night and tax. Extra Person Fees: $25 per additional person above Double Occupancy. Subject to change. Hotel/Resort Fees & Taxes: All reservations may be subject to a City/State Tax of 14%. Occupancy Restrictions: Varies by room type. Maximum of five per room. Parking: Self-parking: Mellon Square parking garage located across from the hotel ($19/night Monday through Friday; $5/night on Saturday and Sunday). There are no in/out privileges for this lot. Valet parking: Available; $36 per night, in/out privileges. Pet Policy: Pets: Allowed; Maximum 25 lbs; $50 per stay per room. Service animals are exempt from pet policy restrictions; please contact hotel to confirm arrangements. Smoking Policy: 100% non-smoking property. Fees apply for violation, at the hotel’s discretion. Transportation: Hotel is adjacent to metro stop; free in the downtown area. With a blend of classic elegance and modern sophistication, the renowned Omni William Penn Hotel has served as Pittsburgh’s premier hotel since 1916. This historic hotel features 597 beautifully appointed guestrooms including 38 suites, 52,000 square feet of flexible meeting space, and five dining options. 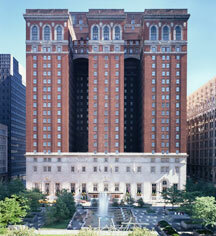 Learn more about the History of Omni William Penn Hotel, Pittsburgh .